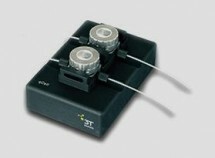 qCell T eChem is the electrochemical version of qCell T. The sensor platform is specifically adapted to combine the full range of electrochemical experiments with the specific insights of quartz crystal microbalance sensors. 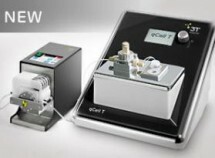 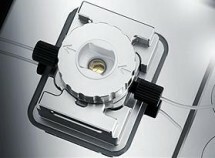 The new qCell T Q2 is a dual channel quartz crystal microbalance with dissipation/damping monitoring. 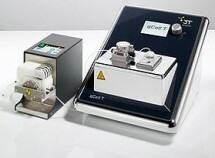 With all the features from its predecessor, qCell T, the second channel permits simultaneous measurement and control. 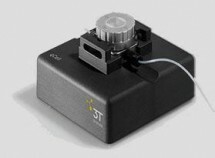 With only 30µl internal volume, the stainless steel flow cell is designed for easy access, fast sensor replacement and to maintain a good seal in its closed working condition. 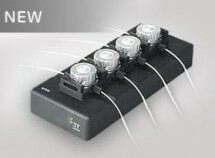 The new qCell Q4 is a four channel QCM with dissipation/damping monitoring from the qCell series. qCell Q2 is the dual channel version of qCell, like qCell without thermal control or automated pump control.